Note that this attack does not work on player characters in Cyrodiil or on any bosses in the game, and can only be performed on creatures belonging to the standard races of Tamriel. Runeboxes are special containers. Each one has a specific Collectible inside; the three introduced in this update have the Xivkyn Polymorphs that were previously only obtainable through rare drops in other Tel Var-purchased containers. Unlike the Collectibles themselves (or most other containers), Runeboxes can be traded, mailed, or sold on Guild Stores. Opening a Runebox will bind it to your account; however, you can only open a Runebox if you do not already own the Collectible contained inside. The Abah's Watch inimitable style is also now available for crafters to learn, and can find the Chapters (or rarely, the full Book) in the Large Laundered Shipments obtained from the repeatable quests found in the Thieves Guild hideout. 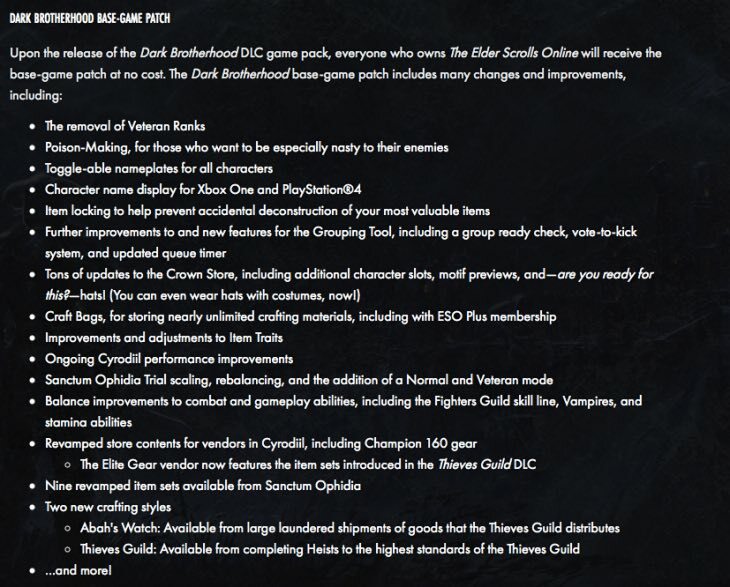 Swear a blood oath or perform the ritual of the Black Sacrament itself with new mementos that can be unlocked by playing through the Dark Brotherhood content. Veteran Ranks have been completely removed from the game in this update! Your strength after level 50 is now simply your number of Champion Points. As Champion Points are gained much faster than Veteran Ranks, this will allow you to advance more rapidly and start getting the best gear in the game faster. Core mechanics (sprint, dodge, block, CC break) will now be slightly more expensive. In order to initiate a vote, the option can be found by right clicking a player character’s name in the group UI. Armor she sells for gold is unchanged, and has either the Infused or Divines trait. All crafting lines except Provisioner will be maxed out. This will be addressed in a future PTS patch. You will have full knowledge of all Equipment Traits, including Nirnhoned. “The Alchemist’s Crate” contains 200x of every kind of Water, every kind of Alchemy Reagent, and every kind of Oil (used in poisoncrafting). This includes the new Reagents introduced with Poisoncrafting, as well. “The Crafter’s Materials Crate” contains 200x of every kind of Refined Material, of every level, for Clothiers, Blacksmiths, and Woodworkers. It also contains 200x of each kind of improvement material. “The Crafter’s Limitless Library” contains the full Style Book for every Style that your character does not know. This allows you to pick and choose which styles you’d like to learn, or you can just read all the books and learn everything. “The Traveled Crafter’s Crate” contains 200x of every Trait item (including both Nirncrux variants), ever refined Style Item currently available, and 200x Crown Mimic Stones. If you equip the Mannimarco reward costume, any facial adornments will display a metallic texture. When using medium or lower graphics settings, some character models will display pink heads. The voiceover in Dark Brotherhood is currently not complete. In these cases, NPCs may be completely silent or have robotic-sounding voices. Currently, the Shadowy Supplier will often fail to provide a stealth-focused reward. Potions and Equipment will be provided as intended. This will be fixed in a future PTS patch. The Monk’s Disguise that the Shadowy Supplier will occasionally award is not currently functional. This will be fixed in a future PTS patch. The Outlaws Refuge maps do not currently have a pin to point out the Shadowy Supplier. You will still be receiving the full XP amount when killing monsters 40 or more Champion Points below your level, rather than at a reduced rate. This is not intended, and will be fixed in a future patch. Poison effects are intended to become weaker (diluted) as the number of effects on the potion increases. This behavior is not yet working as intended, so potions with multiple effects are currently much stronger than they should be. The drain effect on certain poison types is not currently applied correctly. Certain new reagent and solvents currently drop from monsters and critters more often than intended. Poison effects currently have no icon in your Active Effects panel. Poisons currently scale their effects with the level of your equipped weapon, instead of correctly scaling with the poison itself. Poison tooltips often have inaccurate damage and healing values. Several poisons currently have names that do not match their effect. For example, a poison that immobilizes your target may be called a Stun poison. Certain items in the Sithis’ Touch set currently have visuals from the Assassins League style instead of the correct Dark Brotherhood style. The Tel Var Stone bonus is currently being applied while in the Imperial Sewers, which is not intended. You will now receive the Dungeon Finder completion rewards for running White Gold Tower. Charge abilities, such as Focused Charge and Shield Charge, will now fire more reliably. Fixed an issue where players were able to cast some abilities, such as Regeneration, without respect to the global cooldown. Corrosive Armor (Magma Armor morph): This morph now deals Poison Damage instead of Flame Damage. Suppression Field (Negate Magic morph): Redesigned this morph so it now damages enemies standing within the area of effect, in addition to stunning or silencing enemies. Extended Ritual (Cleansing Ritual morph): Increased this morph’s duration to 18/20/22/24 seconds at Ranks I/II/III/IV respectively, from 16/18/20/22 seconds. Increased the damage of this ability and its morphs by 85%, but it will no longer stun or disorient enemies hit. Reduced the range of this ability and its morphs to the standard instant-cast melee range of 5 meters from 7 meters. Power Slam (Power Bash morph): In addition to the changes made to the base ability, we redesigned this morph so while slotted, blocking an attack will increase the damage of your next Power Slam by 25% for 5 seconds. Known Issue: Currently, Thaumaturge is still increasing the tooltip values of those abilities. This will be fixed in a future PTS patch. Fixed an issue where the stealth reticle would not correctly update after going through some doors in the Sanctuary.